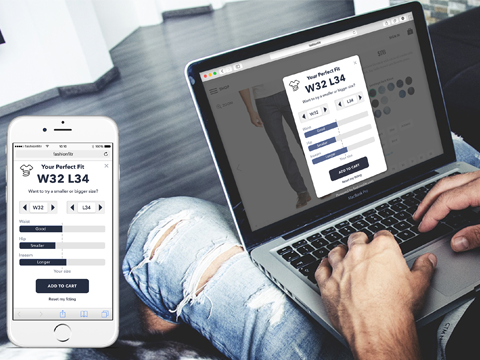 Why should you install fashionfitr™? Claim < style="margin: 10px 0;"p>We have extensively tested fashionfitr™ at multiple fashion webshops over a period of more than 6 months. We saw the return flow decrease by > 20% and an increase in conversion of > 0.04%. 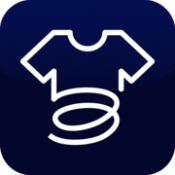 Assuming that an average return shipment costs >€15.00 for loss, freight, handling, energy and packaging costs, this means that fashionfitr™ quickly pays for itself, in fact, fashionfitr™ contributes to a higher shop profit. Fashionfitr™ has two options in the pop-up, i.e. 'compare' and 'measure'. The compare option was by far the most used (92%). This can be explained because by comparing you do not need any measuring tools and physical measuring is generally experienced as very cumbersome. Disclaimer; reducing returns and increasing the conversion are based on a test period at several fashion webshops over a period of at least 6 months. No rights can be derived from these percentages as this may vary per shop. Online shopping is easy, but the problem of online fashion shopping is that you cannot try the product on. Brands often use different sizes for the same measurements. For example, you have a size L from one brand and an M or XL from the other brand. That is very confusing, so that often the wrong or several sizes are ordered per item. This causes large return percentages at fashion webshops. Of this return percentage, the majority (>70%) is because of the wrong size! In addition to a negative shopping experience, return shipments involve high costs, such as freight and handling costs, but also the costs of waste, energy, reconditioning of products and packaging materials. You improve and ensure an optimal shopping experience for the online shopper, making it easier to order the right size of the item to be purchased. This ensures less returns, fewer operations, fewer articles and therefore a higher profit. Less return means a lower burden on the environment and in this way you contribute to reducing CO2 emissions. Fashionfitr™ is a fitting tool that advises the user online on the right size. The Fashionfitr™ CTA button is integrated on every product page of the fashion webshop with the size options. By clicking on this, the fashionfitr™ pop-up opens. Here, the online shopper can enter a comparable (compare) brand that they already have or a few specific body measurements (measure). Fashionfitr™ then quickly and efficiently calculates the entered data and gives the matching customized advice. Fashionfitr™ distinguishes itself because the shopper can see how one 'size bigger or 'size smaller' would fit, which is represented in three body measurements. The blue horizontal bars will shift more to the left (smaller) or more to the right (larger). 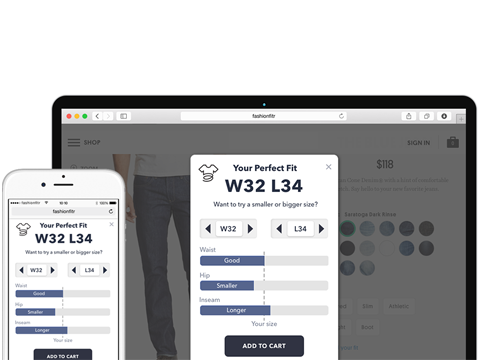 This way we not only give the most optimal size advice from our side, but the user can also decide (interactively) what suits best for 'your perfect fit'. It is possible that two people, with the same body size, find a larger or a smaller size more comfortable. By offering fashionfitr™ to the customer, we contribute to a better service and an even greater shopping experience. Optimizing the online fashion world and increasing the online shopping experience! In short, enough reasons to also offer fashionfitr™ in your shop towards the online shopper! Note: the CTA-button is displayed only to the brands where we know the size information of. Every week there are new brands which make our database complemented and extended.